It's no secret I love a Margarita. In fact, I can find just about any occasion for an ice cold margarita (on the rocks, with salt). Luckily we don't have to find any occasion this weekend because the ultimate margarita holiday has arrived.. Cinco de Mayo! This recipe is for all of you non-mixologist, last-minute, let's celebrate kind of people... my kind of people. No but really, I wanted to create a margarita recipe that felt special yet only takes a few minutes with very minimal effort. This is the kind of marg you make a big ole' batch of and enjoy on your back deck with your person or people. You could definitely go the classic mixology route and make your own simple syrup, juice all those limes, muddle in a few slices of jalapeño. Don't get me wrong, I'm a huge fan of that! I'm just trying to save you some steps here. So when I found the jalapeño lime juice at Trader Joe's last week, a lightbulb went on. It seems like everyone loves Trader Joe's (which means almost everyone can find this juice!) and it completely eliminates those 3 intensive steps I mentioned above! Not into spice? I'm sure you could find a great limeade juice in the supermarket. You'll likely still need the brightness of the additional fresh lime I call for in the recipe. My advice is to taste as you go, and never be afraid to add a little more of anything. No shaker? Mix everything but the fizz in a small pitcher and use a wood spoon to combine. Make sure you stir and stir so it get's nicely mixed and super cold. No need for anything too fancy here, we just want it to taste good. Not into alcohol? No worries! You can still participate. Omit the alcohol and serve over ice with a little extra fizzy water. 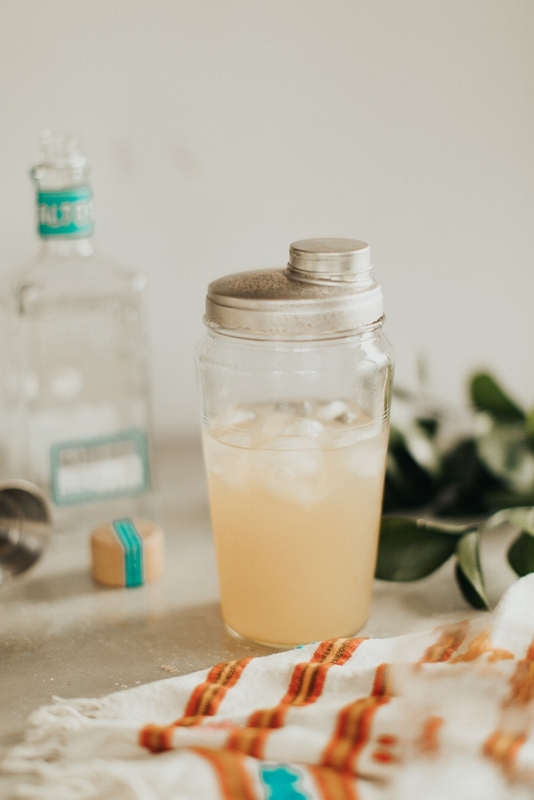 A sweet and spicy margarita recipe, super easy to make, just in time for Cinco de Mayo! Fill a cocktail shaker with ice and pour jalapeño lime juice, Grand Marnier, tequila, and lime juice over top. Close tightly and mix until shaker starts to get cold in your hand, about 30 seconds to a minute. Pour into 2 cups rimmed with salt and filled about half way with fresh ice. Garnish with sugared lemons.